opt_param( ‘cell_offload_processing’ ’TRUE’) hint is used to enable the exadata smart scan feature in sql execution process. Please see some speed comparison below with and without smart scan. I have a table with 24718848 number of rows and 2.6GB size. 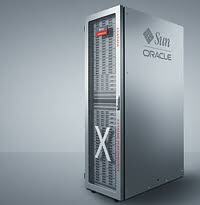 In this example I am going to demonstrate the execution speed difference with Oracle Exadata Smart Scan feature. Here you can see STORAGE key word in execution plan which means it is utilizing the SMART SCAN feautre.